Very deep crimson in colour. Rich and beguiling aromas of blackberry, blueberry and dark plum, followed by signature exotic five spice, star anise, and sage, with underlying nuances of beef stock and dark cedar. Intense and layered, the complex palate bursts with a dense, pure core of sweet spiced plum and blackberry, coated by firm yet integrated, fine velvety tannins which draw away to an extraordinarily long finish and lingering flavours of dried, sweet spices. Due to the very small 2013 vintage, a limit of 1 bottle per person has been applied. …this is a full-bodied Hill of Grace, with blackberry, licorice and anise fruit, the tannins exceptionally well managed, the oak likewise. We have chosen ‘Faith’ to describe our 55th vintage, Henschke Hill of Grace 2013. We certainly needed it as we watched and waited for desperately needed rains to carry the precious yield of our dry-grown vines through to harvest. This is a vintage graced not just by our faith in this brief moment in time, but by the generations who came before us in the gardens of Eden. Matured in 86% French and 14% American (56% new, 44% seasoned) hogsheads for 18 months prior to blending and bottling. "There is a calm, effortless, unassuming confidence to a Hill of Grace, as the stamina of more than 150 years in the soil transcends the vagaries of the seasons. 2013 is magnificently polished, as layers of signature exotic spice weave seamlessly with glossy black cherry and succulent satsuma plum fruit, supported by fine, silky tannins. This is a vintage ready to entice from the outset." "A heady mix of baking spices leading ripe and red black berries as well as plums. There’s also deeper fresh earthy aromas with plum pudding and chocolate. The old vines have delivered an elegant, smooth and concentrated palate with a rich blackberry, ripe dark plum and more savoury tarry nuances, finishing with a comet-like trail of fragrant, toasted spices and hints of mocha. So elegant as to be approachable now, it will be at its best in 20-plus years." "This is a wine with concentration, structure, and generosity. There are chocolate and cherry notes, spices, florals, vanilla bean, dark coffee, dark fruits, and even the merest hint of a nicely charred steak to be found on the nose. Good power, plenty of tannins, but they are micro-fine and silky. A supple texture and incredible length: it just goes on and on." "...rich, sumptuous and sprinkled with spice, it has layers and layers of deep, dark flavour." "A dry season with reduced yields, but all the DNA is here with a rich array of baking spices permeating ripe blackberries, red berries and plums. Chocolate, plum cake, currants, freshly turned and loamy earth and dried sage leaves, too. Very complex. The palate's smoothly arranged around the fine, long tannins that carry a concentrated core of blackberries, tarry, dark stony flavors, ripe blood plums and a long trail of deeply spicy warmth through the finish. Hints of mocha and espresso to close. Elegant, complex and complete. This is very approachable now. Typically though, it's a wine that is best drunk at 20 or more years from vintage." A deep, almost impenetrable ruby, this is a broody, muscular Hill of Grace release. Dark, sinewy, youthful and still closed it shows layers of reserved mulberry, blackberry, sage and spice fruits that only hint at their potential. The palate is sinewy and well structured, tarry and dry with generous underlying ripeness, exceptional length and good acidity that needs time in the cellar but with reward it in spades." "Only a tiny amount of the wine made from a very dry year. Deep purple colour. On the nose lots of spices, with coffee, sage and bay leaf characters sliced with a little black olive. Seamless chalky tannins and fine oak infusion. It's a most stylish wine, with great length and velvety smooth structure. The five spice and dried herbs character lift from the nose. A complex and majestic wine for the ages.."
While every vintage of Hill of Grace is a limited release, 2013 and the following vintage 2014 are among our smallest harvests. No Hill of Grace was made in 1960, 1974, 2000 and 2011. I can’t think of any other single-vineyard wine that had its first vintage from centenarian vines and has continued to be made for another 55 years. The lead-up to the 2013 vintage saw an early onset of summer, with occasional thunderstorms and only four heat spikes, into the 40s, over summer. A cooler than average January followed by a warm February, brought the predicted early vintage even further forward. Even after the dry-fecta of winter/spring/summer the word from the winery floor was that it would be another great Eden Valley riesling year, followed up with some great old-vine shiraz. Fortunately, a desperately needed 16mm of rain came, the first for nearly six months, at the beginning of March to help the dry-grown vines struggle through to full maturity. The roller-coaster weather ride continued through March with almost weekly cycles of hot and cold. Cool drizzly weather at the end of March nearly brought the harvest to a halt, but a return to the Indian summer conditions in early April gave us a chance to get the late varieties in Eden Valley over the line for another great vintage of average yields and fabulous quality. Henschke Hill of Grace is more than just a wine. It is an ongoing story of a single place on earth: of a family, of the perseverance and courage of generations past and hope for generations to come. It is a tribute to Henschke ancestors who travelled from Silesia aboard the ‘Skjold’ for ninety-eight days, on one of the hardest recorded voyages, to embrace life in a strange new land at the bottom of the world. Henschke Hill of Grace is a story of loss, hardship and determination. The fierce independence that brought the German pioneers to South Australia to settle in the Barossa, the promise as they became naturalised Australians, the craftsmanship and doggedness as they created their homes, self-sustaining farms and vineyards. It is the joy that must have swelled in their hearts as they laid the final hand-quarried stone on their own church near Keyneton in the Eden Valley, naming it Gnadenberg ‘Hill of Grace’ in remembrance of home. It is the joy they must have felt at week’s end when they gathered to fill the small church with song. 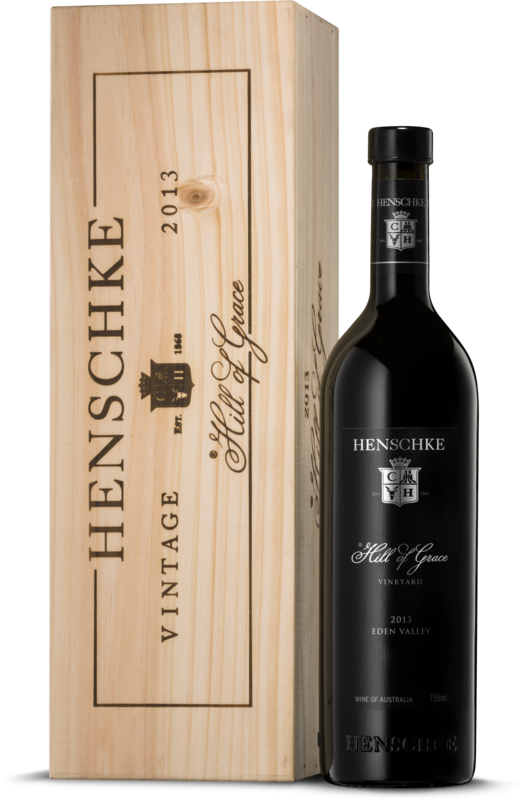 Remembering our ancestors, the former custodians of Hill of Grace and their ability to endure and yet to always celebrate, we have chosen the word ‘Joy’ to mark our 2012 vintage of Henschke Hill of Grace. After the difficult season of 2011 that devastated the Hill of Grace crop, we were blessed by nature in 2012 with a truly beautiful and celebratory season; a long, slow ripening period that was perfectly timed.